I’m just back from Mantic where I was running down a number of loose ends. This is just catching up with some of them. First up, the Deadzone rules are now available digitally for KS backers. I’ve put up an FAQ page to catch questions as they arise and I’ll have a concentrated go at answering them tomorrow when I can sit down with the printed rules. Also, many of you have realised that the DZ rulebook doesn’t include a stat list. This means that you need the cards to play, which you haven’t got yet. At least, not the final versions. This was an oversight on our part and not intentional – we want you to play it! Having looked at the final files we have for cards, they’re not in a printer friendly version at all. Well, they’re printer friendly, if by printer you mean the guys who have a factory that knocks these things out in high resolution by the tens of thousands. Not if you want a single copy without eating 3 whole toner cartridges. It’ll take them a little while to sort out all the decks into a friendlier format and with the Mars Attacks KS finishing this weekend they just aren’t going to have time till early next week. Sorry about that. It’s not forgotten though. 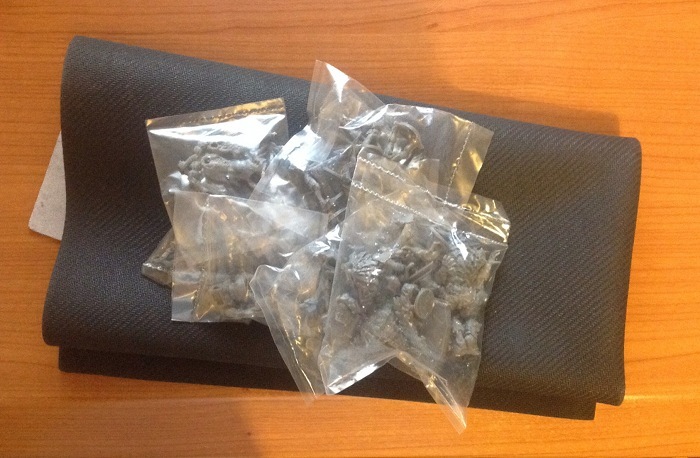 I took a moment to snaffle myself a few bags of the Deadzone production models. Not all of these have arrived in the factory yet, but there are a selection. As regular readers will know, I’ve not been doing any painting or modelling of late and haven’t any personal experience to speak of with restic as a material. However, as I’m slowly getting back into this and have cleaned up both metal and hard plastic models in the last week, now is the perfect time for me to see how restic compares. We’ll come back to this over the next couple of days. If anyone has any particularly good recommendations, suggestions or experience on how best to deal with restic, please comment below. This entry was posted in Deadzone. Bookmark the permalink. The restic I’ve seen so far has been pretty good (damn sight better than GW’s resin nonsense!). Clean it up with a sharp pointy ended knife, splodge some superglue on, prime, then leave sitting in garage for 6 months due to other commitments. Or is that just me? What if I don’t have a garage? So have you gone the whole hog and traded the motor vehicle for a pony and trap? You imagine that. I’ll stand over here. The only restic models I’ve assembled were a season 1 Dreadball team so I’ve not had a bash at the new formula Mantic are apparently using for restic. The models were well cast but an absolute nightmare to clean up due to how hard the plastic is, and it tends to burr rather than turn to dust when filed which made the whole process rather painful and time consuming. Fingers crossed the new formula is easier to work with. “Restic” is apparently a whole family of related materials and Ronnie told me this afternoon that the formula on this one had been “tweaked” to improve it. We’ll see. I suspect that it’s partly a case of learning how to deal with it. From my limited experience with a few Dreadball teams (which I think are restic) it does differ a little bit from my experience with GW models. I’m used to being able to scratch off mold lines with the edge of a hobby knife which I found out isn’t quite as easy with restic. I ended up having better luck by actually cutting away the mold lines which took some getting used to. Sounds familiar! Did you also find that you would then end up cutting away details? I’ve done that with metal and hard plastic too. In those cases it was my own carelessness or not recognising what was detail and what was flash. Doh! Yes but it was only because I was unfamiliar with the models. The restic actually allows for some fine detail but there were times where my bad eyesight couldn’t distinguish detail for a mold line. I used the sharp edge of the knife, scraped rather than cut at an angle, got rid of the mould lines nicely. Yeah a file would make a mess probably. Not my experience. Took me 90 mins to clean up the Dreadball Void Sirens, well I actually gave up and resigned myself to visible mold lines. It’s the one reason I pulled my Deadzone pledge, and can’t back any further Mantic projects. Real shame as I love the rules Jake and the sculpts are not bad but the restic, it’s like shaving a very small bar of human shaped soap. If you’re determined to go for it. Get comfy, get decent lights and jewellers glasses. a VERY sharp knife. I was using a fresh blade every one or two mins. When you shave the line always scrape away from the min, soft and slow avoids limb amputation, theirs not yours. That looks mean. Nor sure I’ve got one of those. Its more or less a similar size to GW own plastic cutters, but much more sharp and precise, that’s why it’s perfect for precision work. Oh and you should find one easily if you look at the women products section in a store, usually with other manucure products and the like. OK. I’ll add that to my expedition itinerary. For stuff like this I like to use an actual knife – if the blade is thin enough to flex of bend you risk blood (I use stuff like that for everything else :). I bought a 20 pack of xacto blades and use them off the handle to peel of the flash using just the very tip. I don’t see restic as inherently bad, but the DB teams were a nightmare in regards to flash. I do hope Mantic was in a position to demand better quality from those spinning the molds. In metal, flash like that is from too low of pressure or too high of RPM. It guarantees a full mold, but quality suffers. Bad mold cutting can also put you in a position that the sweet spot is very fine as well, but that depends on the cutter. I am making the assumption the molds are silicone rather than traditional metals rubber and that restic is a two part resin run through a traditional casing setup with extended cooling time for resin set . Going to harder resin will improve cleanup but will play hell on the mold life. Interesting you say that quality suffers with flash. I was told yesterday by a chap that used to earn his living painting figures, and have been told previously by a figure manufacturer that a good helping of flash is a good thing and means a better model for the customer because it means all the model’s details have filled (and there is metal to spare). That manufacturer deliberately aims for flash for this reason. I can see the logic in that. Especially if it was hard plastic where the resulting flash could be easily scraped away! I think they were both talking about metal. I’m not 100% sure how much of that principle crosses over to other mediums. You’d think it would though. At least, I would. The mould lines aren’t going to be different because they have vents. They have to join in a line around the model – no choice with 2 part moulds in any medium. You may be right. Perhaps what I should have said is that you aren’t going to get rid of mould lines. In any medium that uses a multi-part moulding process they’re going to turn up. The question is how easy is it to deal with them? I have one recommendation to you (and everyone who says you can’t file restic) – Good (*very good*) quality jewellers’ files (or just one if, like me, you tend to use the semi-circle cross-section one for pretty much everything). They file restic just fine. You’ll still need to tidy up a bit with a knife, but it’s the crappy hobby files we all use that causes the ‘can’t file restic’ statements. I know, because I agreed – until I got the jewellers files I’d been recommended. Get a Swiss Vallorbe #4 or #6 (or both ideally, 4 for initial filling and the 6 for a smoother finish). Be warned – these files do not have handles, so you might want to invest in handles for them for better control, grip (though to be honest it’s not that big a deal to use the tang as a handle). Oh, and be warned – these files are not cheap. But they are exceptionally good. Like you, I’ve read “you can’t file restic” in a lot of places, and I’ve been wondering whether that was to do with the fineness of the files. That’s partly why I bought myself some new files at the last con I was at. This is interesting, as is this whole post. I have my Dreadball Teams to clean, build and paint from the Kickstarter as well as Deadzone on its way as I have not had access to my tools and gaming stuff for the last year as its all in storage. I have been looking at diamond files. I have been working on the best solution for Reaper bones but it seems both materials have the save problem that the flash bends and does not cut with normal hobby tools. From my experimenting with finer files it seems the sharper and finer diamond files might be the solution and I am ordering some to try out in fine and medium grit. I have been avoiding any test of a hot knife has I do not like the idea of working with one all the time but that might work. I expect there is a way to get it done beyond my current method of very sharp blade and cutting flash off although it is not that bad it just bothers me to go through a lot of blades plus I don’t want to leave ANY flash which is hard to do with only cutting motion to work with. It’s interesting that the term restic seems to be mainly associated with Mantic. Or so it seems to me. As you say, other members of the same material family are in use by many other companies too, with similar problems. I tried a hot knife on old soft plastic models years ago as they had the same problem. Can’t recommend it. The fine grit quality files angle keeps coming back. I’m going to check what I’ve already got and probably order a couple more for when I get to looking at the older restic models. So far this new variant is happy with the first file I found on my desk – nothing fancy. Those that fail are chopped up for parts? A harsh task master indeed! I have an Assault Team pledge coming, so I am also concerned about how much time it will take to get the models cleaned up and ready for play. Has anyone tried Plastic Sanding Needles on Restic? I use these on Reaper Bones, also a softer material, and it works perfectly. No burrs at all and the sharp tip lets me get to those hard to reach places. Models always take me ages to clean up regardless of what they’re made out of. I know that I take longer than many people which is why I won’t bother timing myself. What’s important is relative ease. That should translate to other people’s experience better. Those sanding needles look like sandpaper toothpicks, which sounds odd but is not a bad idea. I’ll see if I can get some. Would you recommend giving the Deadzone models a wash in soapy water before gluing, chopping and scrapping? I found the Human Dreadball team models to be rather waxy and giving them a base coat of black paint was quite a challenge as the paint wouldn’t stay on the model. By adding more and more paint on i’ve rather overdone it somewhat and with some of the detail now submerged. Doh! I have done this in the past and not noticed any difference, but YMMV. If I thought a model looked particularly oily or dirty I might be tempted to give it a wash.
Hi Jake, you mentionned in this post that you were working on providing the final stats lists and cards in downloadable form to go with the rules pdf. Any update on this topic ? Mantic have updated the digital copy of the rules with some cards (Enforcer and Plague). If you had access to the first one you should have had an email telling you this. I completed my test with the diamond files. I cleaned some bones and a Dreadball season one guard and a ball. With bones I think the diamond files are a worthwhile step up from high quality files. I did not see a big improvement with the diamond files on restic compared to quality files although I will use the diamond files as my first choice on restic. I got medium and fine grit diamond files and it seems all you really need is fine grit and that rifflers are more useful than straight files. Really high quality files should be fine with restic although I will be using the diamond files for restic most of the time and all the time with bones except for using a knife from time to time. The concept of high quality files is not clearly defined so keep in mind “quality” files are subject to range of quality. I am happy with the diamond riffers that I got and will get a lot of use out of them. Restic does not seem to be a good place to use a hobby knife so I will use small pointy jewelry files to work on really sharp inside corners. With both bones and restic it seems a light touch and a vigorous polishing motion works the best with both types of files as the results of slow and firm were not satisfactory. With a light polishing motion you really do not need to worry about handles on the files. Removing large chunks of restic calls for a side cutter or razer saw. In all it seems that abs, metal, bones and restic take about the same amount of time for me to clean with abs the winner as it can be scraped clean with some figures.